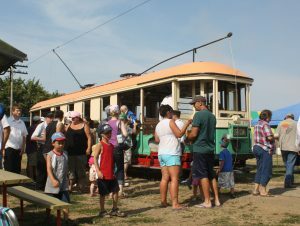 Take a ride back in time, take a trolley ride to our cities past! HELP US! 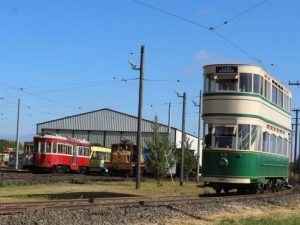 The 20th Century Electric Railway Foundation has provided a challenge grant to save our Brussels Tram Collection. Your donations could be doubled. Click here to learn more! 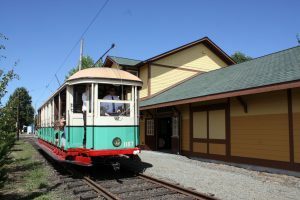 The Oregon Electric Railway Museum is an operating trolley museum. We feature trolleys and other electric railway equipment from the West Coast as well as from around the world. Our railway equipment collection dates from the 1890’s thru 1977. An authentic experience of purchasing trolley tickets at our Depot, Hopmere Station, This station, built by the museum is based on plans of a Southern Pacific Train Station. You will be welcome to tour our carbarn filled with historic railway equipment, some on static display, other in the midst of restoration to service. See what was once was consider out-dated is now considered new again. The Museum is run all by volunteers, from restoration of the streetcars to selling tickets to operating the trolley. Consider joining the OERHS and volunteering your time, or consider monetary donations to keep our trolleys running.